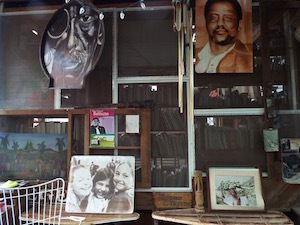 The West Asheville community of Burton Street has deep roots. 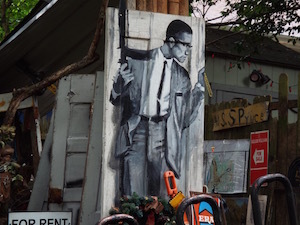 Neighbors have been fighting to preserve the neighborhood and community against development, including the fastest gentrification rates in the US, and the I-26 expansion, for decades. 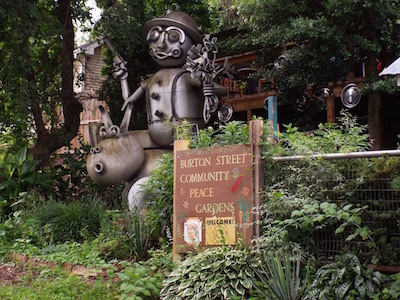 In 2003 the Burton Street Community Peace Gardens were started as a peaceful response to the difficulties faced in the neighborhood, and the world, including the war in Iraq and the escalating drug activity in Asheville. The volunteer run garden has been growing food and community ever since. Beginning as an overgrown lot filled with discarded bottles, the gardens now encompass two flower and vegetable garden growing areas, a performance stage, a fire pit, a pizza oven, a greenhouse, a pavilion, and a plethora of art and sculptures, many of which were done by the garden co-founder DeWayne Barton, community activist and artist who is also the Founder of Hood Huggers International. 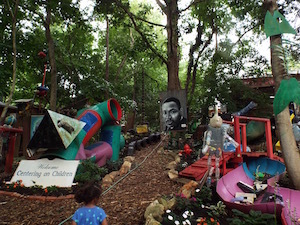 The gardens are a museum - a beautiful complex of found object art, paintings and sculpture. 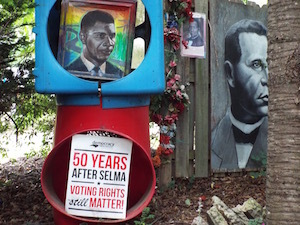 Key figures in black history look out from paintings and glance around corners. Community is an integral part of the Burton Street Peace gardens - volunteers grow more seed starts in the green house than they can use, with the purpose of giving them out to neighbors for their gardens. Also, during peak season fresh produce is bagged and distributed to the elders of the neighborhood. 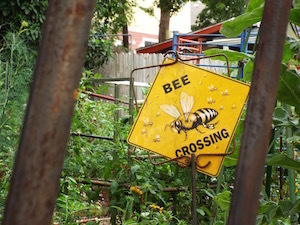 A full array of plants fill the gardens with the purpose of nourish local pollinators like bees and butterflies. 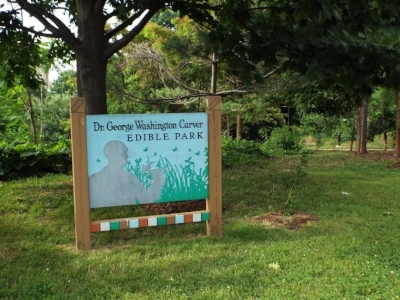 Tucked on a hillside in downtown Asheville, the Dr. George Washington Carver Edible Park is the oldest community food forest on the East Coast. Started by two graduates of Appalachian State in correspondence with a program called City Seeds in 1997, the park was then picked up under the organization Bountiful Cities, and named after Dr. George Washington Carver in 2000. Carver was born into slavery around 1864, and went on to become one of the leading botanists and inventors of his time. 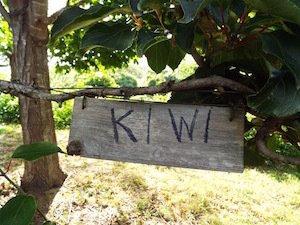 The park has over forty fruit and nut trees, which are all available to the public for picking and eating. 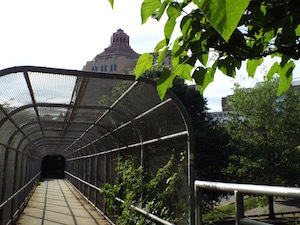 Although this park has been mentioned in The New York Times and The Huffington Post among other publications, it still remains something of a secret in Asheville. In close proximity to downtow,n the park is located on the hillside below the former Stephens Lee High School, which was Asheville’s black high school during segregation, and was demolished in the 1970s along with a lot of the East End community (the Hood Huggers tour mentioned above starts at Stephens Lee Recreation Center, and you can learn more about this garden and the history of the East End on that tour). There is a skywalk located over Charlotte Street that runs directly to the park. 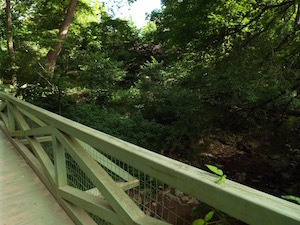 The Botanical Gardens at Asheville is a 10-acre independent, non-profit botanical gardens dedicated to the study and promotion of the native plants and habitats of the Southern Appalachians. The plant collection at the Botanical Gardens is extremely fragile and the garden has specific rules put in place to protect them: Dogs are not allowed in the park, children must be closely supervised, and you must stay on paths and leave the plants alone. Activities such as frisbee and soccer are not allowed. 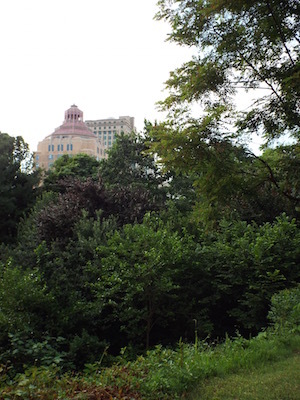 The park is perfect for: a quiet walk, studying plants and flowers, bird watching, drawing, painting, writing, photography, a simple picnic, and yoga or meditation. 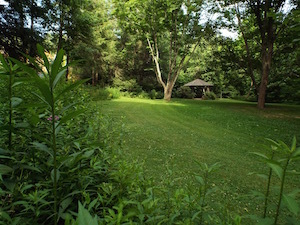 The gardens are gorgeous and peaceful, a perfect escape just minutes from Downtown Asheville. Although many people visit the Biltmore Estate to see the grand 175,000 square foot house, the 4,300 remaining acres of the original 125,000 acre Biltmore estate are a marvel in and of themselves. The entire estate grounds are distinctively cultivated - the original design by the father of landscape architecture Frederick Law Olmstead, and you can see the artistry specifically in the 75-acres of formal gardens. The three mile approach road from the pebble-dash gate house to the main house is also entirely landscaped, although it was made to look natural and uncultivated, the purpose to give guests a sense of relaxation as they approached the grand chateau. Adjacent to the house there is an Italian formal garden which includes classic statuary and three reflecting pools dotted with water-lilies, lotus and papyrus. A four-acre walled garden contains flower beds that feature tulips in the spring, annuals in the summer, and mums in the fall, with an arbor running down through the middle leading to the conservatory, a glass topped building designed by the famous architect Richard Morris Hunt. The conservatory provides plants and flowers for the Biltmore House, and features individual rooms for palms and orchids..
Outside of the walled garden, a shrub garden features over 500 different plants, shrubs and trees, including two N.C. State Champion Trees: the golden rain tree and river birch. Also on the grounds is a renowned Rose garden, with over 250 different varieties of heirloom and hybrid roses. The Azalea Garden is a 15-acre garden that contains one of the country’s largest collections. Chauncey Beadle, a horticulturalist hired by Olmsted, stayed at the estate from 1890 until his death in 1960. He developed a fondness for azalea’s and became known as the ‘azalea hunter’ - collecting as many different varieties as he could find. In 1940 he gave his entire collection to Biltmore, where it was planted behind the conservatory, now known as the Azalea Garden. Today the garden has more than 20,000 plants that explode into color every spring. There is also a bowling green, an outdoor tea room, and a terrace dotted with statuary Vanderbilt brought back from his European travels. In front of the house is an expansive Esplanade with a reflecting pool, ending with a Rampe Douce - a graduated stairway zigzagging along a rough-cut limestone wall the leads up to the Vista - a long grassy slope topped with a statue of the goddess Diana. Behind Diana is one of the two reservoir’s Olmstead engineered to serve the estate. Access to the gardens is included in your visit to the Biltmore. If you have a year pass you can visit the gardens anytime (except in the evening through October 7th 2018 because of the Chihuly exhibit).